This is not right. It might be “legal” but ethically it’s not. When CUSTOMERS sign up for a plan that YOUR COMPANY offers and we are told we can stay with the plan as long as service isn’t interrupted and we will be grand-fathered then you change the contract to benifit you.... it’s not ethical. You don’t seem care because you know that you have most of YOUR CUSTOMERS over a barrel because they have very few options. If “Viasat Listens” then prove it and right your wrong. You offered the plans and now you’re attempting to force people to choose a different one. Viasat, own up to this mistake and do what’s morally right. To the pin heads that are doing this...shame on you!! This is YOUR mistake, not ours. You should have to fix it, not us! Many of the customers, including myself have defended you when we felt you were doing the best you could...this would not be one of those circumstances. I am requesting this post along with all the comments be forwarded up the Viasat chain. I can only get Viasat, Hughesnet, or Frontier DSL where I live - look up Frontier's customer ratings if you think Viasat is bad. I have searched for this "unlimited for $65" Verizon plan several people have mentioned, and all I can find is plans with a soft cap and then degraded speeds, just like we're all complaining about here. Not much of a choice, is it? Thanks panahead - I didn't go thru the prepaid pathway, so I didn't see this. That is how I have understood it in the past too. I mean, is it anymore "unlimited" than what Viasat is?!?!? "I've dug into this further, and it looks like they slow you down to crappy speeds after a certain data usage - as low as 600k after 15 or 20g. Not as much of a deal as I had hoped"
No they certainly do not, you are looking at the wrong plan if you see that. Approaching 150GB this month. Almost 10 minutes before 8pm. Nice barg , Glad your seeing good speeds , How many bars of signal you have atm? Sitting here a little under 11 miles from the tower, at least 1/4 mile of trees right by the house, the hub shows 4 bars. I tried digging in the menu, but I don't see an actual dBm reading anywhere, hadn't looked before, not much in there. As I say, if I get time, I'm going to point the antenna at the new tower, 13 miles away, but line of sight. I'm curious how it will work. Population density drops to around 1 person per square mile in that zipcode, compared to about 3 in mine. So it will have even less users. Heck, I am less than 3 miles from my tower and only get 2 -3 bars. My phone is line one on the prepaid account, on 8GB though. I put it next to the hub, it says -84dBm with 4 bars. Speed test on the phone's data at 8:03, 18.3 down, 9.13 up. Vetsat, before the booster I'd get a shaky 1 with Verizon. But with the new tower, I can get 2 without a booster in some places in the house. Also, my yard doesn't seem to have dead spots like it did before (phone would drop out in the middle of a couple pastures, especially about 3/4 mile away, and didn't work at all in my machine shed, etc.). That new tower is there, I haven't stopped closer to it to do a speed test to see if it's any faster. I was thinking I might at least get a better quality signal from it without going through the trees. They are going to blow out the mifi devices, as a new model hits in March. Supposedly, the new model will be 4G and 5G compatible (even though 5G will he extremely scarce at this time). Barg - I looked at the plan information link and links contained therein for the "unlimited" prepaid data plan ($65/mo with autopay), and it states what I posted above for mobile hotspots. It's not easy to find, but it is in there. If I am in error, please show me where it says so - you would make my life much easier. OK - not sure why that got posted twice - sorry! I just did some looking. I'm probably blind, but I don't see it anywhere. What you describe is how the ~post~ paid accounts act (or data capped phone plans that have hotspot access, the old unlimited plan, now not available had 600k hotspot on the phone). Either I'm not seeing it, which is possible if they changed it recently (nothing in the news about that change), or you accidentally got into the postpaid section. Could you maybe post a link to what you're seeing? Going through the motions of buying a jetpack, this is about as detailed as I see (attached). Now, it does say 720p video, I suppose Verizon might enforce that some time, but they haven't yet (streaming speed for me is capped around 10meg, which is better than 1080p). In fact, I expected them to put in more limits, which is why I got it right away hoping they might grandfather a person in. But, things like 720p, still good enough for me (plus, VPN gets around that). I've had this plan since it came out, and have used approaching to or over 100GB each cycle, and I've read reports of people using a LOT more data than me with no issues or additional slowdowns. Plus, Verizon has no data meter with these plans, there isn't a way to check data usage to see how much you've used (from the company). Barg - I found the info I talked about in the prepaid plan purchase process. I went to prepaid data plans, selected a device, selected the unlimited plan. On the screen where you choose your plan are two links, one of which is "important broadband information" www.verizonwireless.com/support/broadband-services/ . www.verizonwireless.com/support/important-plan-information/. It is the data in this link that specifies the speed limitations I speak of. I am, however, confused, because the page you pictured above, which I have also found on my own, seems to contradict the limitation policies I am asking about in the link I provided above, specifically notes 1 and 4 - 1 because the plan offers unlimited high-speed data. There is a Verizon store nearby; perhaps I should go talk to them to seek clarification. Thanks for your help in trying to sort this out! Why does it keep double-posting? Because this Get Satisfaction platform is a total piece of crap. Members have complained about it for years and asked Viasat to go back to the old style of forum which was much more user friendly. I'm doing chores now, but searched the page you mentioned briefly. I'll look better later in the day after I'm out of the tractor. Quick search, I didn't see prepaid on that page but could have missed it. It mentioned above and beyond, and other plans, which are all postpaid. I didn't see prepaid mentioned in a search of the page, but, did it quickly. Verizon reps often don't know about this plan, you have to ask for the plan number sometimes. Howardforums and Reddit have a lot of discussion on this plan. It is what we say it is. @fmj, they should have kept the Wildblue forum, off topic section especially. After another ~quick look, that does look like it's for the post paid only. The mobile hotspot/tethering in that is referring to the feature on a smartphone, not a jetpack. The limitations on this plan are the "HD only" streaming, and also, it is deprioritized full time. So, similar to satellite, if your tower is congested, during times of congestion, you will have slower speeds because you are behind the priority customers. But, like my area, doesn't happen, at least noticeably. And, areas with more capacity see faster speeds. There is no threshold, no additional slowdowns after X amount used, and no hard throttling to a certain speed, period. Plus, even at slower speeds, low latency helps a lot. I had the smartphone unlimited prepaid plan for a while, hotspot was unlimited at 600K, which I often got around 700. Low pings, page to page web browsing was "excellent". Without video, basic use, it worked well enough -here. Essentially, being deprioritized full time, you are getting a portion of left over/unused capacity, ...sort of. The plan number to ask about is 28366 I think if you speak to a rep and they don't know about the prepaid unlimited jetpack plan. Also, a few youtube videos about this plan, and articles, some people do have congestion. But, prepaid, not out much if you try it and it doesn't work. Went to a Verizon store today and found about the level of knowledge I expected. She was "pretty sure" the prepaid was not subject to throttling, and then told me that it didn't matter because jetpacks are limited to 600k download speed all the time. Guess the rest of my research will have to be online. Thanks for your help! I read about some experiences with the reps, that's why people posted that plan number when the reps couldn't even find the plan, had a little bit of experience myself, just with ordering, online..., direct from VZ, adding it to an existing account, before I got it on my own from Amazon. The plan works like we've said. Can't say it will work for all the people considering it, because, as with satellite, several variables. I know that it won't work "great" in all areas. No way of knowing without trying it out first. But, every time I've run a speed test, it's close to the one's I've posted and talked about. I usually figure most stuff out myself, might not get it exactly right, but things usually turn out. As far as Verizon is concerned only the manager in the local store seems to be knowledgeable, the other two employees both told me things that were wrong about the Jetpack. I even got bad advice from tech support over the phone. They definitely aren't the greatest, but for me they are 10 times better than VIASAT. Mark. very well said! i couldn't agree with you any more... Their behaviour is wrong and unethical! Anyone know a good reporter that can get this story out to the masse?. Only the Court of Public Opinion has a chance of influencing Viasat and/or Viasat investors! Just read your other post. My contract will be up in April so I will probably be right there in line with you to turn in my Viasat stuff! If they don't get this fixed by then! I believe Deku was one of the first to report the email if I am not mistaken? She was also quite upset with the performance of her internet. When you have lost Deku's support for your product, turn off the lights the party is over! Didn't you post something about "median" speed around the first of the year??? Then you also posted how bad your speeds had been. I remember posted where did the real Deku go! I am supporting you here. Not sure why you seem upset. P.S.S.!!! IF VIASAT EVER NEEDS TO CALL ME ON MY CELLPHONE NUMBER A 2ND TIME!!! ILL END UP CHANGING IT!!! AND NOT GIVE VIASAT MY NEW PHONE NUMBER!!! OR!!! ILL JUST END UP NOT ANSWERING!!! I GOTS 2 OPTIONS FOR MYSELF!!! NOW IF YOU CAN EXCUSE ME!!! IMMA LEAVING THIS FORUMS FOR A COUPLE OF DAYS TO WEEKS!!! SOOOO!!! GOOD DAYS!!! Do I like it? NO, NO, and NO again. Do I understand why it was done, Yes - have to keep the revenue up to even offer residential service and, with the VS2 problems, it's going to be VS3 before things start to look better. So yeah, I'm riding it out, Hughenet being my only other option. VS3 isn't that far off and, maybe it will get better then. I'm sure Brad, Diana and Matt B would like to say more, but they probably want to keep their jobs. Tough business decisions must be made for residential services to remain a viable segment of Viasat's offerings and some subscribers truly don't have a viable option. If Viasat were to go out of business or abandon residential service in favor of commercial and government focus, many of us would be SOL. There will most likely be some collateral damage when the dust settles as we limp along toward Viasat-3. Many of us would definitely be SOL. I'm one of them. My only choices are satellite and dial up, with Viasat being the best of them by far. Panahead. Viasat-2's antennas failed to fully deploy, As a result its coverage area was impacted. While publically Viasat said it wasnt that big of deal and The antenna failure would have a minimal impact, an insurance settlement of around $185 million dollars due to lost revenue suggests otherwise. Initially when Viasat offered the 150GB priority data "unlimited" plans, I thought that was an awful big leap. About 6 months later my fears were realized when they significantly curtained the amount of priority data. A year later they are doing this again. Again, while it wont be disclosed publically, I fully believe it is due to Viasat-2's failures that we continue to see these plan modifications as Viasat struggles to handle increased internet traffic with less bandwidth than they originally planned on. But what do I know, I am not an internet engineer, nor do I play one on this forum. VeteranSatUser. thanks for the info...i appreciate it... it makes sense and certainly helps to understand the current situation... but like my grandpa always said... "never count your chickens until the eggs hatch"
Exactly! I feel the "unlimited plans were released before they should have been. I suspect pressure to maintain and increase revenue in light of stagnant customer growth is what happened. Now they have a mess. Regardless, I am not the one that lured people into 'unlimted" plans that were not really unlimited and offering 150GB of priority data. Many people gave up Freedom and Liberty plans for it, paid more, and found they had less. Now, over a year later, they are degrading those plans more. Putting myself un those customers shoes, I would be mad too. Just because a company has the right to change a plan doesn't mean they should, alienated long time customers. Those chickens that were incubating and hatched on Viasat-1 during the fall of 2017 have simply come home to roost. The Unlimited Plans on Viasat-1 were a test trial for Viasat-2. The conference calls suggested that 40,000 subscribers hopped on them on Viasat-1. The question often asked but never really answered was where did all of the capacity come from to offer those. Similar questions were asked about "virtually unlimited" Freedom and can't be much more than the number of unlimited users on Viasat-1. 150GB is the magic number. The capacity was never there. So let's estimate 100,000 as a guess on the plans affected based on subscriber counts for older birds they've probably still got upwards of 400,000 limited plans users that there attempting to satisfy with these changes. It's a numbers game as I see it, but I could be wrong and probably am. Speculation ran rampant during those days, despite repeated statements by the moderators here that they only were anticipating better plans. Not saying any don't have a right to be angry but what is the solution on Viasat-1? I see none, that will satisfy the majority of subscribers on Viasat-1 other than that which has now been adopted. Think about that panahead, what is the only way that Viasat can guarantee you a minimum "speed" at any time given a fixed capacity of 140 Gbps (or 140,000 Mbps). Now consider that that 140 Gpbs is probably distributed equally across all 72 beams and some will suggest that Viasat can shift capacity between beams on Viasat-1 bt I don;t think that's the case. How many users (a rough order of magnitude on each beam and total overall) could be supported if guaranteeing a minimum of 1Mbps per user at all times. Its a capacity issue not speed. Old Labs (VS1-329-L12FZ) i am certainly not a expert in data management nor do I even pretend to understand it... all i can do is try and find a compromise that might work for those of us that have been affected by the change... they seem to have the ability to prioritize certain accounts... just wondering if they might be able to find a way to give us more bandwidth than 1mbps during prime times of congestion? Thoughts? I wonder how many accounts were grandfathered in and are affected by this change? 10,000? less? more? Not unless they limit the number of subscriber's that can be connected - not sure anyone would appreciate having to wait in line for somebody to logoff before they could use it. At home, I demand nobody else take a shower while I am nor should they flush or use the hot water, but I can get away with it and it's one of the inconveniences of being on a well. The only thing I do with my little bitty share of that Viasat-1 bandwidth is use it efficiently and shift my usage to off hours but I have the flexibility to do that, other don't. Regardless, the winter of our discontent continues. Old Labs is exactly right as always. Keep in mind that Viasat-1 is already 7 years old, yet it was designed at least a decade ago. Internet usage has changed a lot (look at streaming alone) since then. I mean Viasat-1 initially offered plans of 7 5GB per MONTH. Think about that! That is not even one 2 hour HD movie today. So as consumer internet needs have changed, Viasat has struggled to keep up with the demand. Things are going to get worse before they get better. I agree 100% that our appetite for bandwidth is only going to increase.. by a lot! what do you think is the answer to feed us all that live in rural areas without cable.. fiber.. hell even landlines? how do the small satellite networks that have been talked about work? 5g? more cell towers? what is it going to be in 5 years? Old Labs, I can remember back in the '90s I had a small family run dial up service. Worked fair until evening came, and their servers were taxed to capacity, and there were times that I would have to try to connect up to a dozen times before establishing a connection. Frustrating, but it was all we could get around here. And with the quality of Verizon's land lines, ma speeds I ever saw was 21 Kbps, but 18 Kbps was more typical. The plan had no data limits, but was o slow I couldn't reliably connect to my online banking. I gave up that and went with Wildblue in 2008, that 500 Kbps connection seemed like heaven. Ties have certainly improved since then. Thankfully Viasat isn’t owned by Sears. Since this "re-definition" of 25M speeds has been put in place, I have not seen more than 14. * up and 1. * down at any time of day or night; I keep a weird schedule, so I can check it via Speedtest during on and off hours. This has gone on for weeks - well before I received the e-mail we have all come to love. My Verizon 8800L is on it's way. What route did you take to get the 8800L with the prepaid unlimited plan?!?! With Barg's help, I did a lot of research on the plan and the best device for it. The 7730L looks good too, but it is out of production even though it is still available (according to a VZW rep), and I need a tethered connection to my LAN, which nothing else provides. The 8800L is the latest and greatest, even though it seems to be having some teething problems - heck, my Viasat modem conks out more than 3 times per day, on average, for no apparent reason. I ordered an 8800L from a provider on ebay because no one anywhere near me has it in stock yet. Several different chat sites and a VZW rep told me it is compatible with the unlimited prepaid BYOD plan, so I pulled the trigger yesterday. I will have it this week, and will see how things go from there. During the last week I have been experimenting with my VZW phone as a tethered hotspot, and I have been getting consistently better (sometimes very much better) speeds than with my Viasat connection; in addition, my average pingtime is 10% of a satellite time or less (I understand that may not be a reliable prediction for the 8800L's performance, but it will be close). I have no longtime beefs with Viasat, but over the last couple years it has gotten progressively slower and the modem has become more prone to randomly restarting itself. The last few weeks have really soured the experience for me. I knew what I was getting into with a satellite connection - when I came to Viasat it was truly the best option available to me. Due to the recently degraded performance and "definition" of 25M service, that no longer seems to be the case. Also, it appears that my edit to my previous post isn't showing up; I had added a sentence to explain that most of the time my speeds are much worse - 2M to 5M down, occasionally much lower, with primetime being in the 300k to 500k range more often than not. Yes. I saw you can attach a nice antenna to the 8800L. But how do you know you can then switch it to the prepaid unlimited plan? If you buy the prepaid unlimited plan from the start, the 8800L device is not an option. Appreciate the updates. My speed is back to normal (normal for me is 500kbps to 1Mbps during primetime). But this unlimited plan could be a way to transfer a ton of content from to avoid going into a 150GB hard cap like what happened to Gwen. In the old days the Viasat hard cap was around 225kbps. They can't even deliver that to me at times, and that was 2.5GB of data into my usage cycle! In fact, the 8800L is an available option for the unlimited prepaid plan, but it is not yet listed as such on the VZW website. I have received several confirmations of this from enough sources that I feel I can trust it to be true. What did you pay for your 8800L? I paid $179 for mine. The list price is $199 or more at most retailers. Price sounds right. The 8800L has good reviews. I think 15 devices can connect to it too. I wonder if any wifi extenders work with it? If it has a router built in it should work with an extender. Exactly... but if you want or need to connect the signal to a Ethernet cable I think that this will work? @vetsatuser I tried an old Linksys RE3000W I had and it worked, only 2.4 ghtz. But that was ok. Then I plugged it into a tplink router. I don't use an antenna with mine. I only get 2-3 bars and it is still awesome. Not much traffic where I live. Hey Panahead - let me know what antenna you get and how it works out for you. I hear you there - it is about 5 miles for me, in the woods, so I expect it to vary with the seasons. I had VZW as an ISP once before - before 4G LTE was even available in my area, so I have some idea what to expect. I will probably keep my Viasat account for a month or two as a fallback in case there are unexpected problems. i took Gwens advice and got this antena... https://www.amazon.com/Proxicast-Cross-Polarized-High-Gain-Fixed-Mount-Antenna/dp/B01NBSLNJ6 and the cables... you need 2 sets of cables and pigtails to make it work... gets pricey when it is all said and done.. but if it doesn't work then i will return it all... it is just sad that Viasat did what they did to us... i was a happy camper..
That is one serious antenna! I look forward to hearing how well it works for you. I agree about Viasat - I play some online games, but found I could live with 600ms ping times. The speed was better than I got from anyone else when I signed on (June 2014). I was ecstatic when the 150G 25M plan became available in my area, and I jumped all over it. It worked really well for quite some time, but the last 6 months have been a bit frustrating, and the last two months have, well, read my posts above. PrestonPig hmm... i went to town and picked up the new fancy antenna... and... it sadly didn't live up to my expectations... my verizon Mifi on its on... without a exernal antenna was getting 1 to sometimes 2 bars... i hooked up the new antenna and was only able to get maybe 3 bars max... tried pointing it and gradually adjusting it then waiting for the results... even rebooted the gadget a couple of times... but 3 bars (out of a possible of 5) was maximum... my download speeds were between 1mbps and up to 2.5 or 3 mbps.. but my upload speed were average maybe 5 to 6mbps? going to call the manufacture tomorrow and see if the guys in tech support can help me... and if anyone has any ideas please feel free to chime in.. i could use any and all help..
That is about what I get out if my tower. That ping and jitter are way too high for a wireless connection. VeteranSatUser I agree... the tower is just under 8 miles away...(straight line) and it isn't line of sight... I have a mountain ridge between us... so... not optimum.. but it's what I have to work with... here is a another test I just did... getting better..baby steps... thoughts? help? Ouch - I'm sorry you didn't get the results you were hoping for. If you can gain a bar consistently it helps, but I would hope for two additional bars. When I had VZW as my ISP in the past, I had similar problems - before 4g LTE was available here, but a can antenna from the 3gstore helped a lot - I was usually able to maintain at least 3g speeds. Perhaps they can help you if you need it - they specialize in cellular internet solutions. Nonetheless, I still feel good about how it will work for me. I have been using my cellphone as a tethered modem the last few nights - it is also a VZW device with hotspot abilities. I generally only get two bars with it sitting on my desk, but I just ran a speed test not 5 minutes ago: Viasat:627ms ping, 11.22 down, 1.16 up; VZW 37ms ping, 17.69 down, 1.01 up. earlier today it was as high as 5.15 up. Don't give up just yet - there is probably a solution out there. You are awful far from the tower to begin with, and don't have a line of site. I am afraid you are going to be limited with speeds. Viasat is probably still going to be your best option. here is my current speed with Viasat at 9pm on Sunday night.. dial up would be faster... at least on the download part... ? I certainly saw numbers like that recently. A stagnant customer base and alienating a number of customers, driving them away. I think there is more going on to these customer agreement changes than meets the eye. That is why you see such bad prrimetime speeds. Internet usage continues to increase while Viasat-2 failed to provide the expected relief. Now they are trying to reign in usage after over committing. This is right now. Not the highest I have gotten. But very usable. I have a Smart TV & Roku hooked up to it. It is 9:26 am. I am working through VPN and have 4 VMs running. I couldn't even come close to that. Your tower is probably connected to fiber. Mine isnt. It appears to use wireless to connect to another tower. In essence, my tower appears to be a big repeater. This article, while a couple years old, is still depressing. While you might get good 4GLTE today, there is only one way the speed is going to go. Just got the email today from Viasat with the bad news. It looks like those of us on the Freedom 12Mbps plan are not immune either. Keep us posted on your speeds. IDC about Stephen's magic beam speeds. I want to know how people are people impacted by this plan change. I just got the email this afternoon too. Freedom 12 mbps, no service in my area from the technically impacted VS2 so my choices, if I were to switch plans, are 12 mbps Liberty 12, 25 and 50 GB ones. This morning speed was 13.2 mbps, now at 5:45 pm it is 5.3 mbps. I varies greatly most days from 13 mbps to 840 kbps. I have used 26 GB of my 150 GB allotment. Still good speeds. I don't get too wound up until I see speeds south of 500kbps. That is a problem. I think I'm just gonna ride it out for now and see what happens. I'm not a heavy user during primetime so hopefully it won't affect me too much. Switching to Hughes is not an option as those plans are way worse than what Viasat offers. My options for downgrading on Viasat are unlimited Bronze 12, Silver 25 and Gold 30. I don't think those are on Viasat 2. That's what I have available in my area (Bronze 12, Silver 25 and Gold 30). It's not enough to entice me away from what I already have. Gabe, what plan are you currently on with HN? The plans Hughes offers in my area are worse than Viasat's fake "unlimited" plans. I have the 20GB Gen5 plan. It's enough for me. I've never run out of data. I do take some advantage of the 50GB of 2AM to 8AM data, though. Your plan is similar to Viasat's Silver 25 plan but about $30 cheaper per month. I wouldn't switch either. My speeds tend to be very good, too, luckily. I'm on a Stephen Rice type beam. LOL. Honestly, the speeds on my Freedom plan have usually been pretty good as well. I didn't even experience much slow down this past holiday season. My beam must not be as congested as others. What kind of speeds do you normally see, and how much difference do you normally see between day and evening? I can usually get 12-17Mbps during the day and in the wee hours of the night/morning. During primetime I don't even bother running speed tests because I know it's probably gonna be terrible. Mine can dip pretty good in the evening, too. And when the congestion hits, forget even watching something on Youtube in 360p. Well you hit the hard cap. In the old days, the old cap was 225kbps. They can't even deliver that to you now! When I had my old legacy plan and hit the daily cap, there was barely enough speed to even be able to get onto the token page to use one. It would often time out. So we're talking probably under 30Kbps. Someone said you have to use different email accounts for Vzn prepaid vs. postpaid? I did see some people having issues with that. With an existing phone it was really easy. Their prepaid support isn't the best. SonyaA are you up and running with the Jetpack now? Yup, the setting up the account part was a nightmare for me uhg. Took over 2 hours with support. I tried to set it up everything went good till I tried to log back in that's when it got caught in a loop they had to remove my account to fix it then add me back. @Sonya , What are your typical speeds on your jetpack ? I can't speak for Sonya, But I've had my 8800l jetpack activated for about 29 hours now. Most of my speed tests are around 20M down. 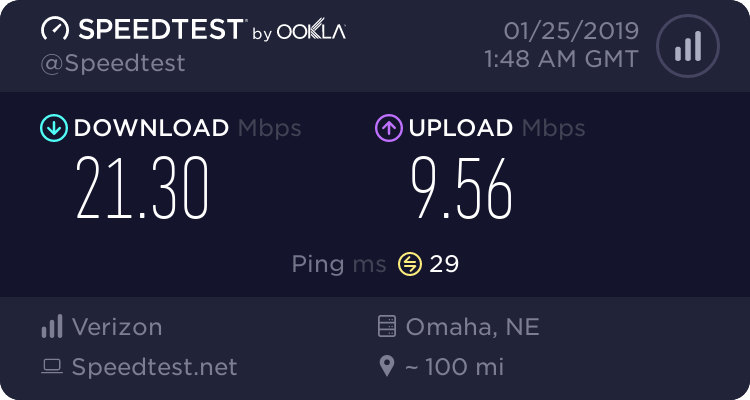 I have had two test during "prime time" that were closer to 10M down Just now - midnight CT, I got: 50ms, 19.55 down, 3.01 up. Highest I've seen so far was apprx. 23M down, 5M up. I haven't cancelled my 150/25 plan yet, but it won't be long. @preston , Wow thats pretty good speeds , Im glad its working for you well : ) Can you tell us about how far you might be from a tower ? and if your using a antenna etc ? By my rough figuring, I am 5 miles as the crow flies from the nearest tower (maybe a bit more - I really must map it out one day), with slightly hilly terrain and lots of trees between us. I expect these speeds to slow down as spring approaches and the trees leaf out, and some more in summer when the tourist season is in full swing. On the other hand, I have no external antenna, and my jetpack is sitting on a windowsill that's sorta on the same side of my house as the cellular tower, so there's room for improvement. I also expect these speeds to still be far better than some of the crap speeds I've been seeing since the "re-definition" of what 25M means.